Home Business Could These Little Scooters Be the Future of People Moving? Could These Little Scooters Be the Future of People Moving? Just east of the shop-lined streets of Old Pasadena on Colorado Boulevard, a narrow storefront resonates with whirring drills and clinking metal as a small group of men work on a factory line. 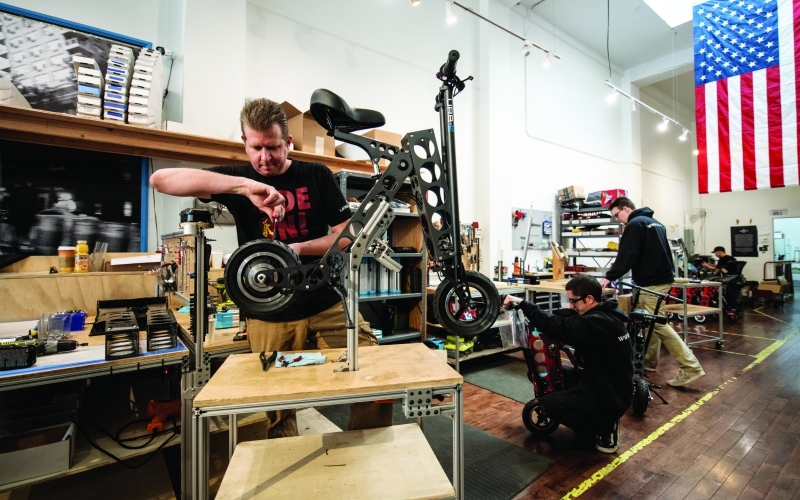 It’s not a scene you’d expect in the retail district, but the electric scooters they’re building aren’t typical either. 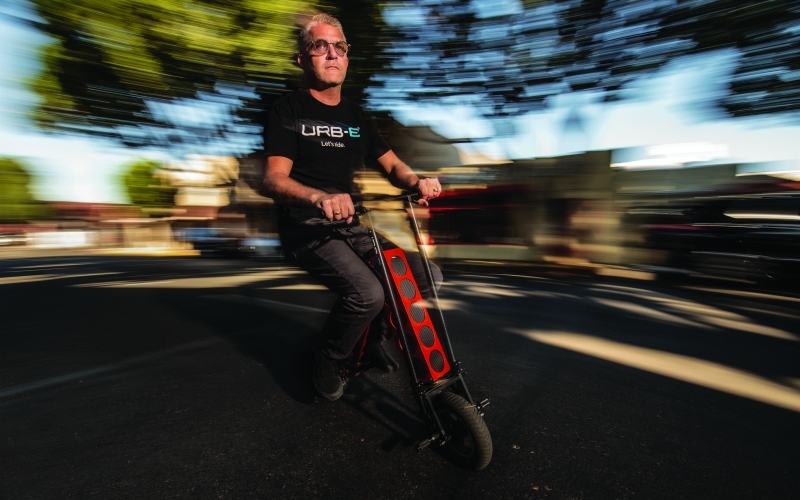 An upside-down metal V with two teeny wheels, the Urb-E is foldable and light enough to carry. Which is why the scooter is being marketed as one way to address what transportation folks call the “first/last mile” problem: how to get people to and from Metro stops and stations. In fact, along with the Hoverboard, it’s one of only two “rideables” (i.e. super-portable electric vehicles) Metro and Metrolink allow on buses and trains. Grant Delgatty conceived of the Urb-E in 2012. Forty-seven years old with close-cropped salt-and-pepper hair, he has designed everything from furniture to footwear. Making things move has always been his real passion, though—bring up motors, wheels, or speed, and his stoic demeanor quickly evaporates. “I love anything vehicle-related. In fact, my two sons are named Dezin—kind of like ‘design’—and Racin,” he says with a grin. Delgatty was teaching courses on mobility at ArtCenter College of Design when he took a crack at making a scooter in his Pasadena garage. He cut weight-reducing holes in the frame, a technique he borrowed from airplane design. The local aerospace industry was also one reason Delgatty kept production local. “There are very precision-based manufacturing capabilities here in L.A.,” he says. Delgatty has packed a lot into a little package. The Pro GT model can haul more than 300 pounds, travel about 20 miles on a single charge, and hit speeds of 18 mph—though steep inclines are still a challenge. Scooters that aren’t shipped to customers go to the company’s nearby store on Green Street and a new one at USC Village. Ranging in price from $899 to $1,999, Urb-E is probably too costly for many county public transportation users, 71 percent of whom make less than $25,000 a year. But Metro has looked into workarounds—in 2016 the nonprofit Coro studied rideables for the agency. “If we’re serious about first/last mile [solutions], we want to make sure they’re accessible,” says Julia Gould, a former Coro fellow. Among other ideas, her team pitched a rideable rental program akin to Metro Bike Share. Delgatty is already exploring technology that would allow people to unlock scooters via smartphone. But a public share system would require a lot more money, infrastructure, and planning (the company Bird Rides, which began renting out more traditional motorized scooters last year, ran into legal issues in Santa Monica for operating without authorization). RELATED: 11 Tips to Master Scootering in L.A.